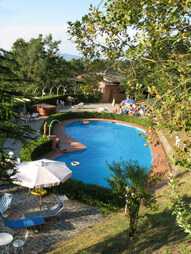 Spa wellness Tuscany presents thermal pool in Maremma Toscana Italy near Siena. Switch to our new Hotel Maremma Tuscany Prategiano website ! Enjoy our warm water pool with hydromassage - Relax like in a hot spring thermal pool! 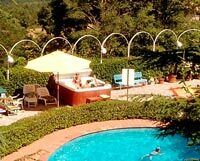 Whereas the unheated big pool is open from about mid May to mid September, you can relax body and mind having a massage in our heated pool in Tuscany (jacuzzy) all season long! The hot water (35 - 38 degrees Celsius, depending on the season) provides exacly this natural feeling of wellbeing that you need after a long day of sightseeing, excursions, horse riding, hiking or mountain biking. Slip into the steamy, bubbling spa for your daily dose of calm. Since the time of the ancient Greeks and Romans, people have found natural healing powers in bubbling pools of hot water. Now studies tell us that hydrotherapy can ease the pain of sprains and muscle-related injuries, and speed the repair process after a strenuous workout. Simply relaxing in a spa can also promote a good night's sleep. The bikers and riders among our clients asked us frequently for the possibility of having a good massage. We therefore decided in spring 2004 to install this high quality spa, which offers place for 6 people, on the the terrace of the swimming pool. Now you do not need to worry about tight muscles or an aching back. Specifically designed jets deliver comfort like a personal masseuse to those body parts that need it the most; neck, back, feet, and shoulders. The spa has different jets and seating areas for addressing different kinds of hydrotherapy. A fully-reclining lounge is designed to target your body’s pressure points and deliver a full body massage. Two muscle-specific therapy seats and three comfortable body-hugging hydrotherapy seats, 44 jets and cushioned headrests ensure total relaxation. For those of you who remember their lessons in Latin: SPA „ Salus per acquam“ – And feel relaxed and fit for your next adventures in Maremma Tuscany.